Perhaps unexpectedly, this issue starts in Russia. The first Russian hydrogen bomb test has just been completed and an oddly jolly Kruschev is celebrating the fact that the globe hosts two atomic superpowers rather than just the one. His subordinate is less excited about the prospect of radioactive armageddon, but it's clear he's just not looking at things properly and he is promptly arrested, but not before hearing some interesting potted history about Stalin and the Soviet succession that took place after his death. Kruschev's philosophy is clear: do what you have to to stay alive and be prepared to shoot first, something his hapless advisor has learned far too late. 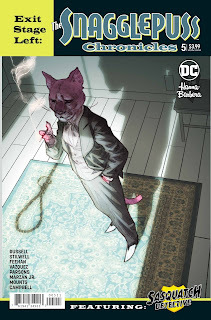 Are these lessons worth applying to Snagglepuss' situation? Well, our pink-furred hero is under a lot of pressure to betray his principles. Much of that comes from the fact that the authorities, represented here by do-gooder Gigi Allen, have arrested his best friend Huckleberry Hound and are using his homosexuality against him. 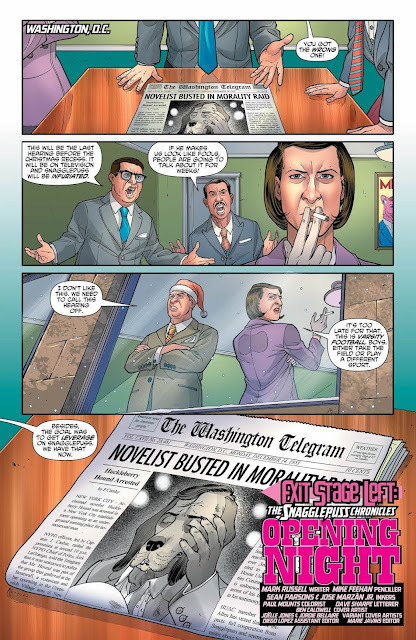 There is some to-ing and fro-ing between Snagglepuss and his lover about whether he should give in to Gigi Allen's pressure to play along with the congressional committee looking into 'subversive' culture before whom he's set to appear very soon. Ultimately, that pressure is eased somewhat by Huck taking himself off the board in a very dramatic and poignant way. It's here that, arguably, Russell is at his most manipulative. 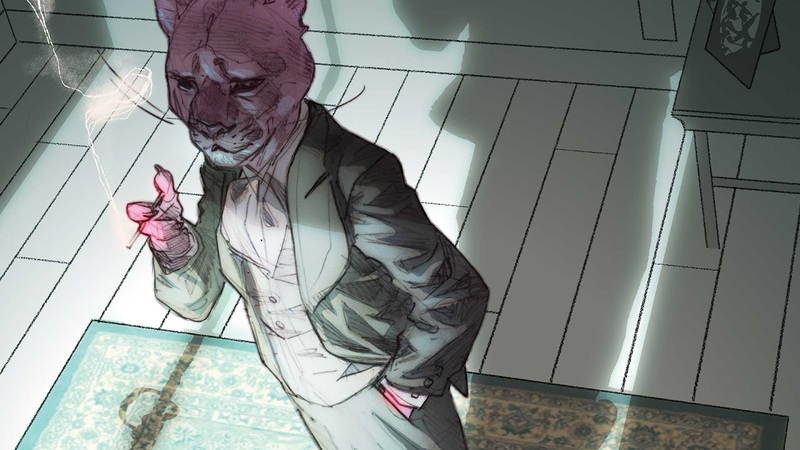 He gets to portray Snagglepuss as both a good friend to Huck and a brave man speaking truth to power and standing up for his principles. Huckleberry Hound's death allows Russell to have his literary cake and eat it. That said, Snagglepuss' speech to the committee is tastily written and Russell knows how to ratchet up the tension very well indeed. 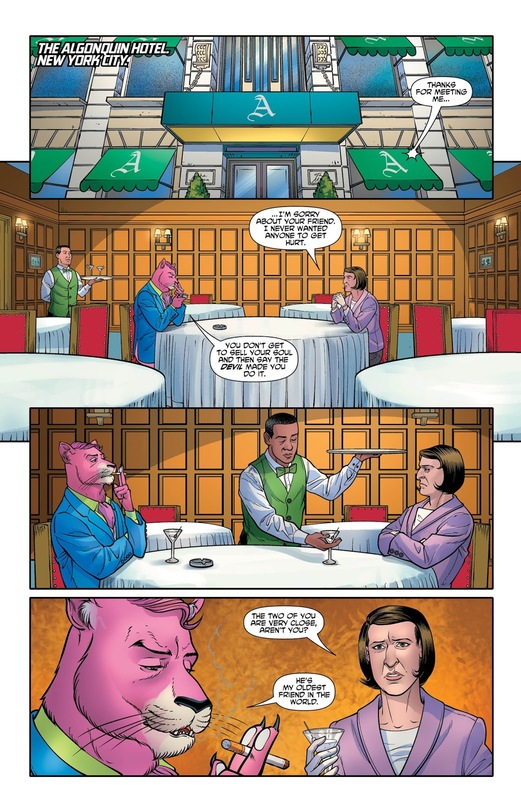 Feehan and co's art, too, is excellent here – bold, dramatic and portraying Snagglepuss' contempt for his questioners beautifully. Unlike earlier issues, this one is fairly straightforward plot-wise and this helps create a sense of momentum that makes this issue actually fairly exciting to read. That doesn't mean that Russell's script is perfect. While it's understandable that Snagglepuss' speech before the committee is big on rhetorical flourishes, it's a touch platitudinous for me at times and some of the sentiment on display is laughably crude. ("Any culture worth a damn is written by subversives"? Really?) Given that this is a comic book, though, perhaps I shouldn't be too harsh. As well as giving his main man plenty of space to strut his stuff, Russell even allows a moment or two of humanity from his antagonist, which softens her cartoon villainy rather engagingly. The Snagglepuss story ends on a note of high courtroom drama and, for the first time, I find myself questioning the decision to run a backup strip. Sasquatch Detective remains as inoffensive and inconsequential as ever, but, compared to the main feature's moments of tragedy, pathos and heroism, it's almost embarrassingly weak. Guy Vasquez' art is lively and entertaining, but this month's tale (SD goes undercover to visit a spa to bust a ring of robbers) seems to exist purely to provide set up for a gag about SD smelling bad because she got her fur wet. That said, Brandee Stilwell is one of the few DC creators to acknowledge what's happening in Tom King's Batman run, so there is that. We're on course for a climactic showdown with the soul of the nation at stake. Or something. 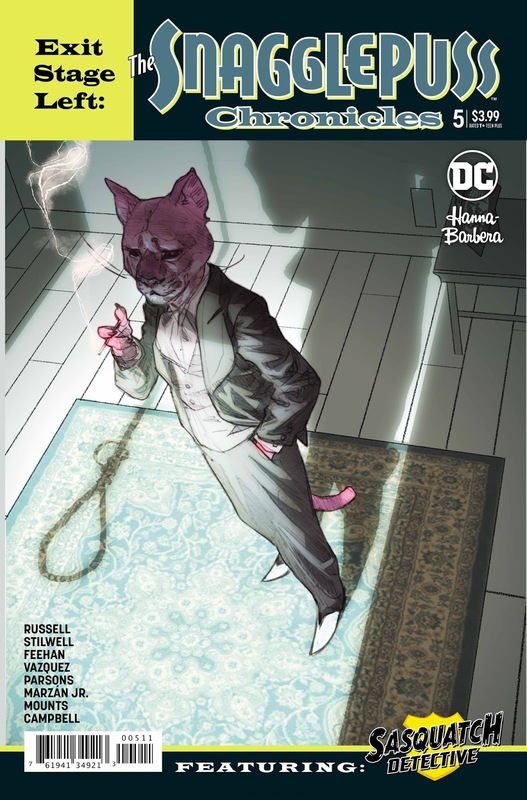 Russell's writing continues to be engaging, if a little preachy, and Mike Feehan's art continues to be invariably good and, on a couple of occasions, genuinely breathtaking. While the thinly-veiled cultural allegory/satire and the implicit parallels between the Cold War US and the present incarnation of everyone's favourite superpower may be a bit too simplistic for some, there is a solid story here and it's one that I'm continuing to enjoy.